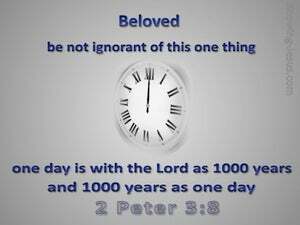 ﻿ 2 Peter 3:8 But, beloved, be not ignorant of this one thing, that one day is with the Lord as a thousand years, and a thousand years as one day. Don't forget this fact, dear friends: With the Lord a single day is like a thousand years, and a thousand years are like a single day. But beloved, this one thing you should not ignore, that one day with Lord is as a thousand years, and a thousand years as one day. But do not forget this one thing, my dearly loved ones, that as the Lord [counts time], one day is like a thousand years, and a thousand years are like one day. 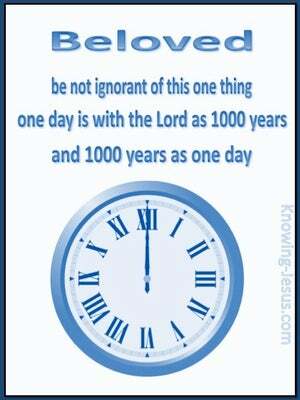 But, beloved, be not ignorant of this one thing, that one day with the Lord is as a thousand years, and a thousand years as one day. 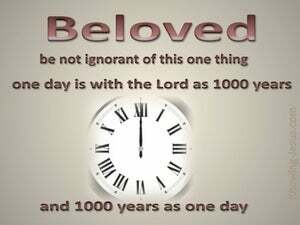 But do not ignore this one fact, beloved, that with the Lord one day is like a thousand years, and a thousand years like one day. But there is one thing, my brethren, you ought to be appriz'd of, which is this, that "with the Lord one day is as a thousand years, and a thousand years as one day." But let not this one thing be hidden from you, beloved, that one day with the Lord is as a thousand years, and a thousand years as one day. But this one thing, let it not escape you, beloved, that one day is with the Lord as a thousand years, and a thousand years as one day. But let not this one thing be forgotten, beloved, that one day with the Lord is as a thousand years, and a thousand years as one day. But do not overlook this one fact, dear friends, that with the Lord one day is like a thousand years and a thousand years are like one day. 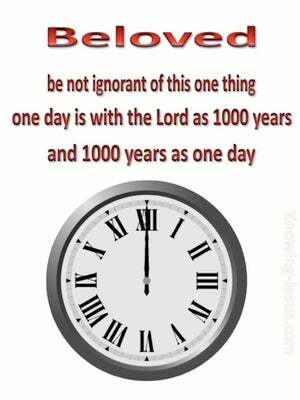 But, beloved, be not ye ignorant of this one thing, that one day is with the Lord as a thousand years, and a thousand years as one day. 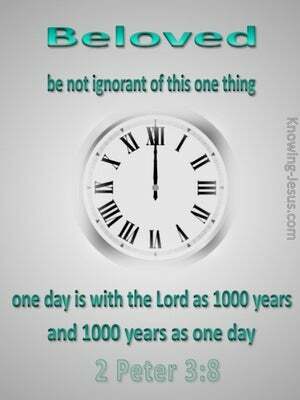 But, beloved, be not ignorant of this one thing, that one day before the Lord is as a thousand years, and a thousand years are as one day. And let not this one thing be unknown to you, dearly beloved, that one day with the Lord as a thousand years, and a thousand years as one day. Now, dear friends, do not let this one thing escape your [notice], that one day with the Lord [is] like a thousand years, and a thousand years [is] like one day. But, beloved, let not this one thing be hidden from you, that one day is with the Lord as a thousand years, and a thousand years as one day. Dearly beloved, be not ignorant of this one thing, how that one day is with the Lord as a thousand years, and a thousand years as one day. 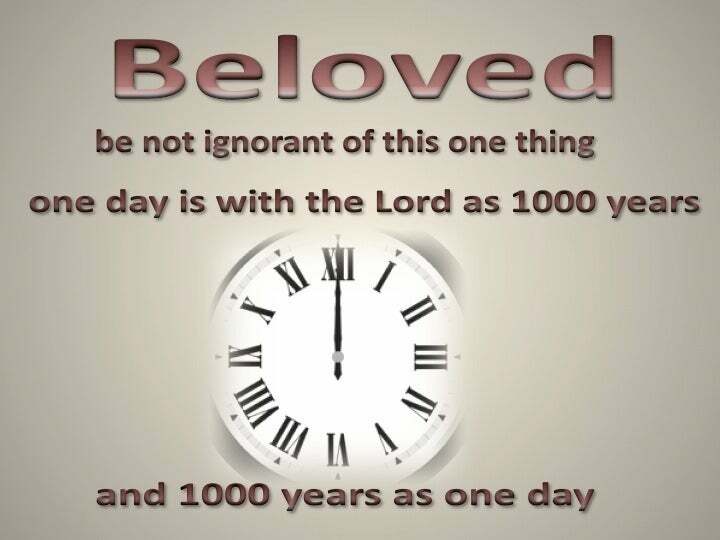 Beloved, you must not ignore this one fact, that with the Lord a single day is like a thousand years, and a thousand years are like a single day. Do not forget this one thing, beloved, that one day is with the Lord as a thousand years, and a thousand years as one day. Now, dear friends, do not let this one thing escape your notice, that a single day is like a thousand years with the Lord and a thousand years are like a single day. But do not forget this one thing, beloved, that one day is with the Lord as a thousand years, and a thousand years as one day. But forget not, beloved, this one thing, that one day is with the Lord as a thousand years, and a thousand years as one day. But let not this one thing escape you, beloved, that one day with the Lord is as a thousand years, and a thousand years as one day. But, this one thing, forget not, beloved, - that, one day, with the Lord, is as a thousand years, and, a thousand years, as one day. But let not this particular be concealed from you, beloved, that one day with the Lord is as a thousand years, and a thousand years as one day. But you, dear friends, must never shut your eyes to the fact that, to the Lord, one day is the same as a thousand years, and a thousand years as one day. But there is one thing, dear friends, which you must not forget. With the Lord one day resembles a thousand years and a thousand years resemble one day. But you must avoid forgetting this one fact, dearly beloved, that with the Lord a single day is like a thousand years and a thousand years are like a single day. But don't forget this one thing, beloved, that one day is with the Lord as a thousand years, and a thousand years as one day. But, beloved, let not this one thing escape you, that one day with the Lord is as a thousand years, and a thousand years as one day.